Take anarchic driving destruction on a world tour and experience the pure arcade adrenaline-rush of Burnout 3: Takedown. Combine aggressive high-speed racing with the ultimate in slamming crash action to boost your way to the top. 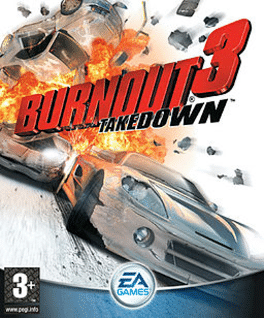 Takedown the competition across the USA, Europe and the Far East in over 60 Race events, or crush all comers with Burnout 3: Takedown's junction-jamming Crash event pileups. Push it to the next level with five competitive multiplayer models, then move the mayhem online to compete against up to seven players. Reap the rewards of dangerous driving, earning Crash $ and Burnout Points to unlock over 60 hot vehicles, coveted skill trophies, front-page headlines and much more.